The municipality of Yenişehir (51,837 inhabitants in 2012, 31,643 in the town; 78,600 ha) is located 50 km east of Bursa. 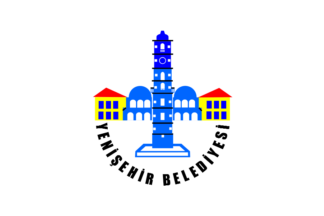 The flag of Yenişehir (photo, photo) is white with the municipality's emblem in the middle. "Belediyesi" means "Municipality". The emblem of the municipality features the clock tower (photo) built in 1930.